An essential part of a Musikgarten music class is playing simple instruments, like rhythm sticks, rattles, jingles, and drums. Children love to explore these instruments and I want to make sure I have a selection of the highest quality available for my students in the classroom. Since we, as the teachers, are models to the parents, parents often ask me, “What instruments should I have in my home for my children?” Parents value instruments that are not only fun to play but ones that will also last over time and make beautiful sounds. There are lots of instrument choices for parents to purchase on the internet but many of these choices are not appropriate for young children. If it looks like a toy, it is probably a toy. Instruments that have an excellent sound quality. Instruments that are made of natural materials. Instruments that are safe for children to handle. 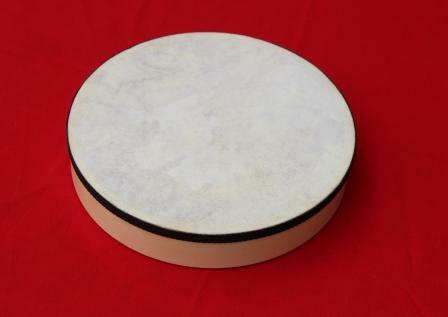 In the classroom I mainly use instruments that Musikgarten offers, including their beautiful and simple drum. It has a wood frame, natural calf skin head, and is sturdy, but light weight. It is perfect to put on the floor and have the children play with their hands, but light enough to hold while standing. I always make sure I have enough for everyone to have a drum. 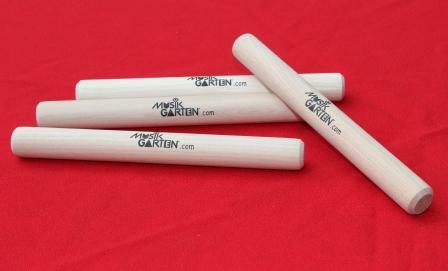 Musikgarten sticks are natural and have no varnish added to them so they can be mouthed by the babies and tapped by all the children. These sticks need to be smooth and have no rough edges. I like sticks that are small enough that they cannot become a ‘sword’ and heavy enough for hands to actively tap in various ways and roll on the floor. Perhaps they may even become letters or houses. I also have sticks with ridges so we can explore the sounds of insects, trains, rubbing or other imaginative sounds. 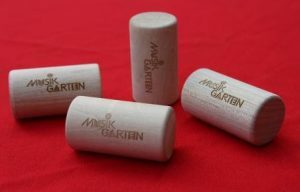 Musikgarten rattles are also made of wood and large enough so they cannot be swallowed by the youngest baby, but are small enough to feel comfortable in little hands. With these cylinder shaped objects we can tap, pound, and roll and, yes, create towers to crash to the floor in a noisy heap. A classroom can survive with only these instruments – great news for new teachers on a budget. As the years have passed I have collected and adorned my studio with ethnic drums, band instruments my own children attempted to play while in school, bells found in antique shops and garage sales and other odd assortments perfect for a play-along time. These instruments are like flavor to a stew and can be used for a fun celebration at the end of class or at home. I have also found it very helpful to give parents some instruction on how to store the instruments. My favorite suggestion is to collect all those instruments and place them in a music area in your home. 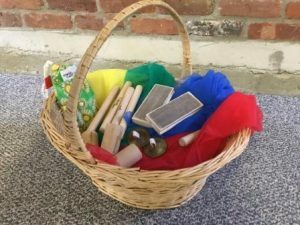 As families participate in the Baby and Family music program they receive a home instrument with each unit including a set of sticks, rattles, bells and sand blocks. These can go into a basket which is separate from the toy box. Add a music player that children are allowed to control, place the basket of instruments on the floor and you have music time! Then when your music time is over, place the basket OUT OF REACH of the children. Why? I believe instruments should be treated differently from toys. They are tools to create sounds and are taken out and put away when the activity is done. Remember, for both your studio and when advising your parents, to keep it simple. Choose instruments that have a great sound quality, are made of natural materials, and are safe for children to handle. I advise staying away from plastic instruments and those 20 instruments in a set deals that you can find on the internet. Homemade instruments can also be fun as long as they are safe for the children. Eventually the question comes up from parents, “When should I purchase a piano for my child?” This is a blog article in itself, so stay tuned for the answer!